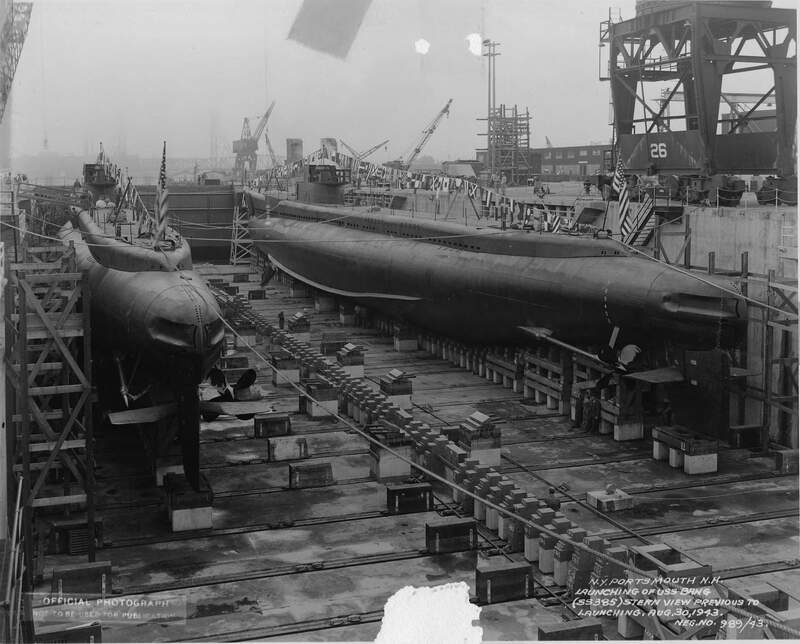 Balao Class Submarine: Laid down, 15 May 1943, at Portsmouth Navy Yard, Portsmouth, N.H.; Launched, 30 August 1943; Commissioned USS Pilotfish (SS-386), 16 December 1943; sank at Bikini 25 July 1946; Decommissioned, 29 August 1946; Struck from the Naval Register, 25 February 1947; Final Disposition, Raised and sunk as a target, 16 October 1948 off Eniwetok." see "Operation Crossroads", Jonathan M. Weisgall. 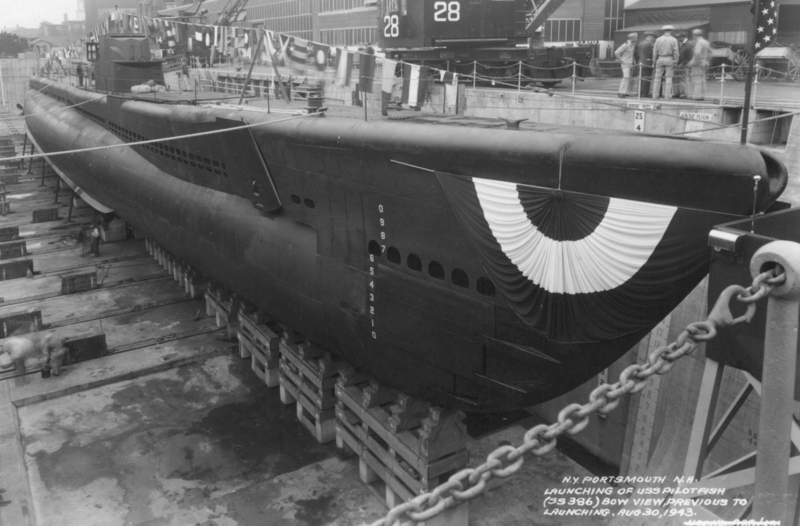 790k Bedecked with bunting and signal flags on her bow, Pilotfish (SS-386) is pictured here prior to launching at Portsmouth Navy Yard, Portsmouth, N.H., 30 August 1943. USN photo courtesy of ussubvetsofwwii.org. 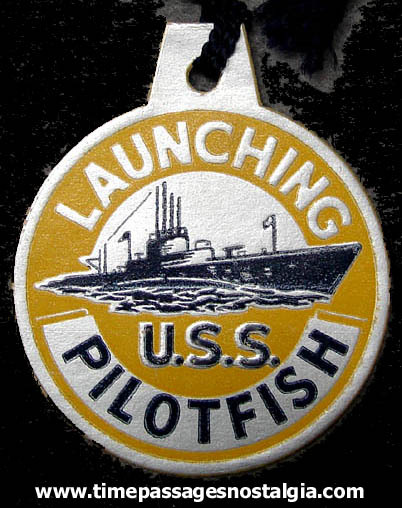 57k Commemorative launching tag of the Pilotfish (SS-386) at Portsmouth Navy Yard, Portsmouth, N.H., 30 August 1943. Photo courtesy of Ron Toth, Jr. via Tom Kermen. 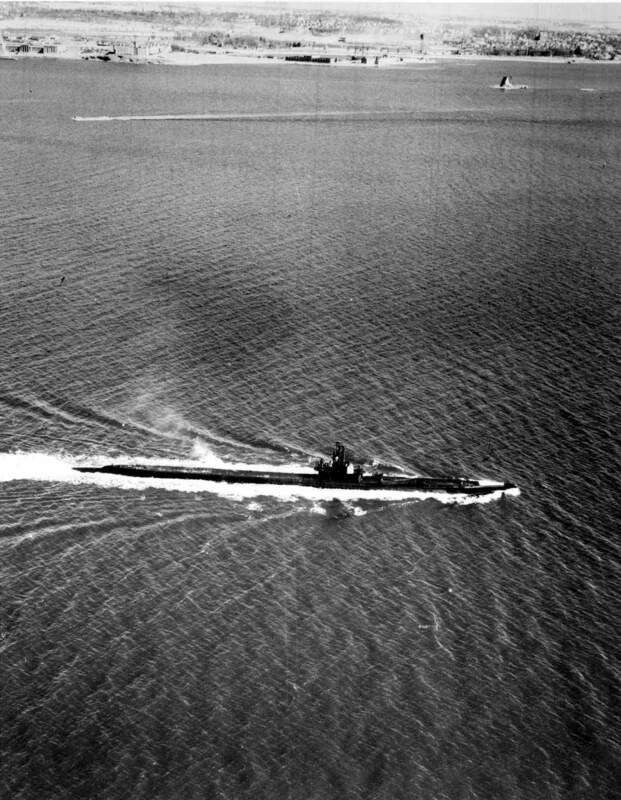 274k Starboard view of the Pilotfish (SS-386) undergoing training and shakedown in the Portsmouth area, circa late 1943, early 1944. 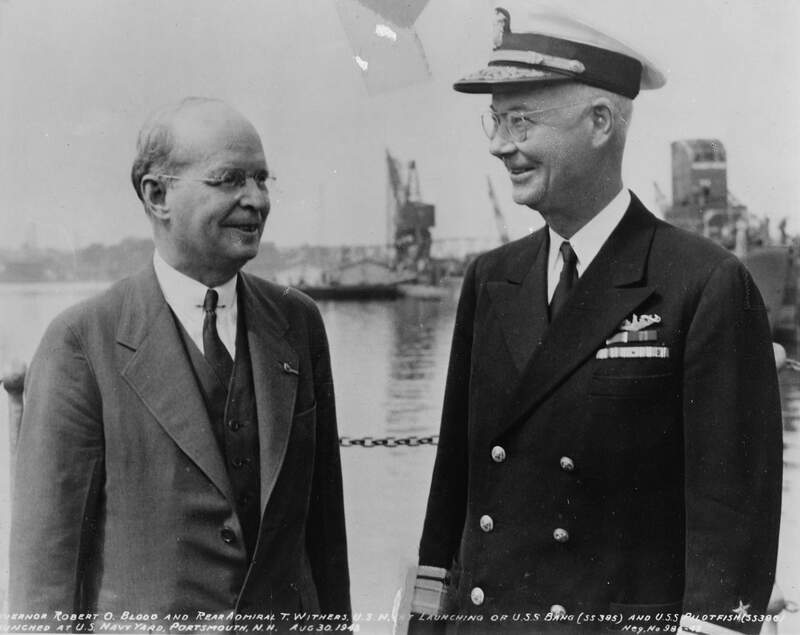 NARA (National ARchives and Records Administration) photo # 80-G-269706, courtesy of ussubvetsofwwii.org. 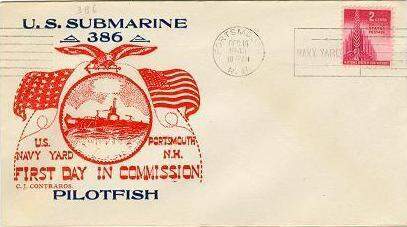 18k Commemorative post mark from Pilotfish's (SS-386) first day in commission, 16 December 1943. Courtesy of Jack Treutle (of blessed memory). 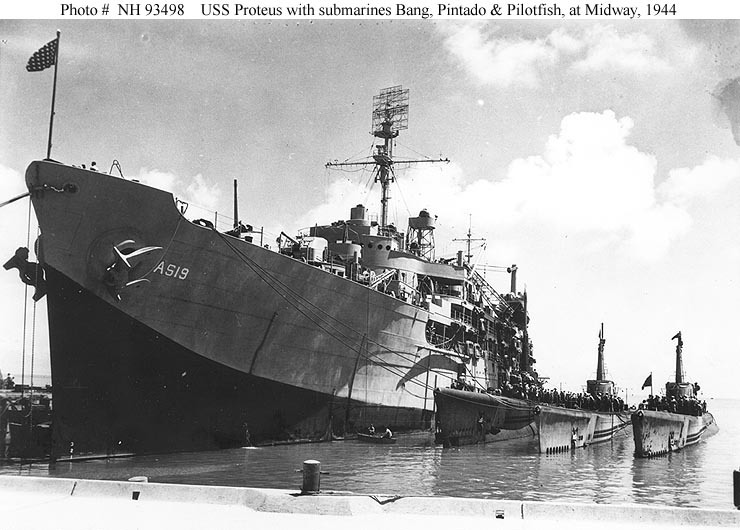 95k Proteus (AS-19) with submarines of Submarine Squadron 20 alongside in Tokyo Bay, on VJ-Day, 2 September 1945. Names of the submarines present, their commanding officers and the commanding officers of SubRon20 and Proteus (AS-19) are printed at the bottom of the image: Archerfish (SS-311), Cavalla (SS-244), Gato (SS-212), Haddo (SS-255), Muskallunge (SS-262), Pilotfish (SS-386), Razorback (SS-394), Runner (SS-476), Segundo (SS-398), Sea Cat (SS-399), and Tigrone (SS-419). Courtesy of Captain Joseph F. Enright, USN(Retired), 1979. USN photo # NH 95019, from the collections of the US Naval Historical Center. 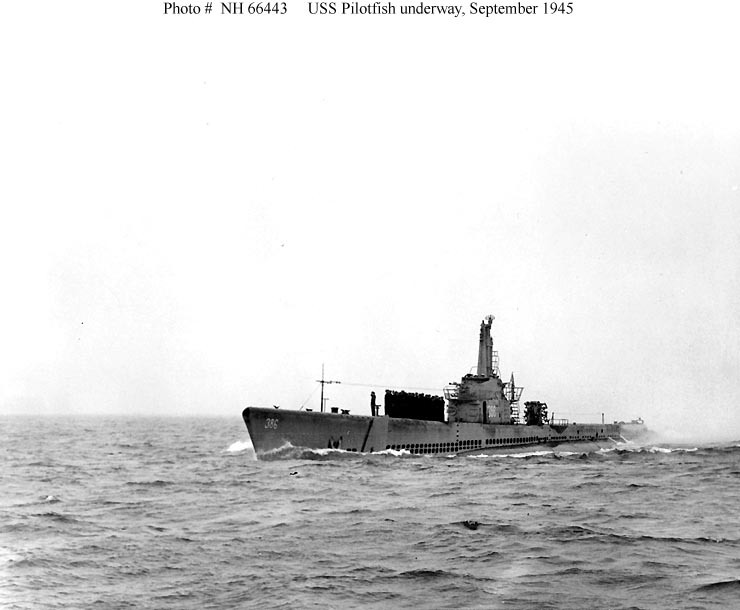 52k Pilotfish (SS-386) underway with crewmen at quarters, September 1945. Probably taken upon her arrival at San Francisco, California, on 21 September. USNHC photo # 66443. 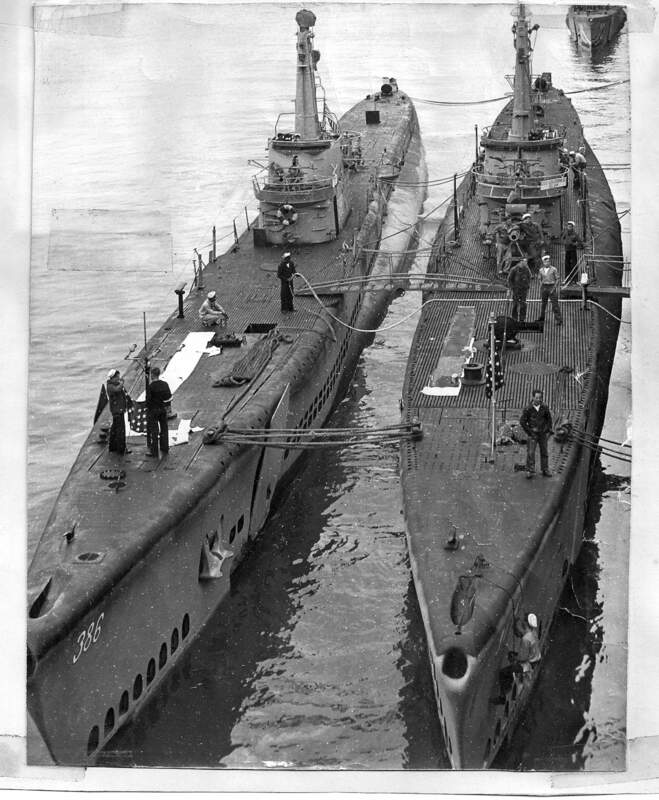 700k Pilotfish (SS-386) & Loggerhead (SS-374) with crewmen at quarters, September 1945. Probably taken upon her arrival at San Francisco, California, on 21 September. Photograph courtesy of Angelo L. Lombardi via his daughter Mariann. 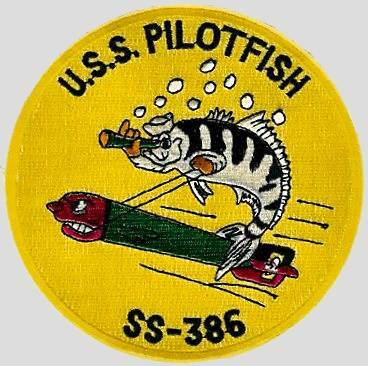 569k Three page PDF history of the Pilotfish (SS-386). PDF courtesy of Scott Koen & ussnewyork.com. 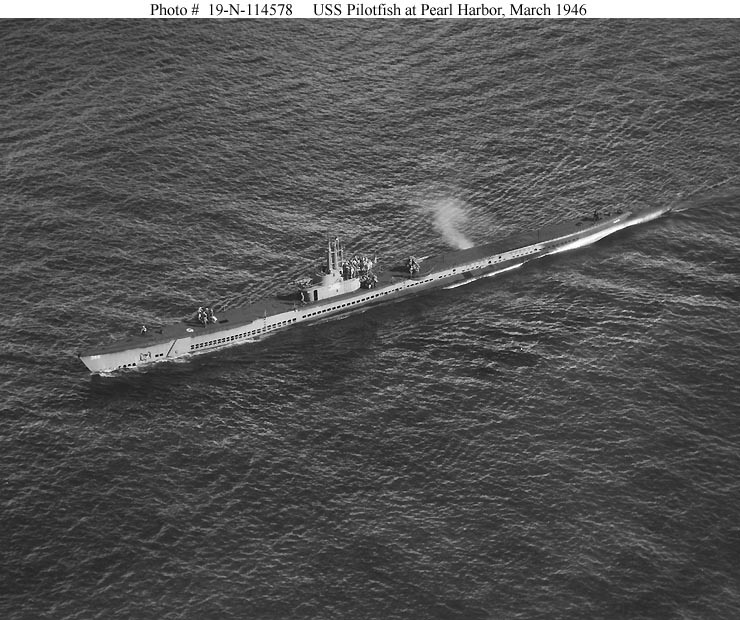 119k Pilotfish (SS-386) at Pearl Harbor, Hawaii, 6 March 1946. 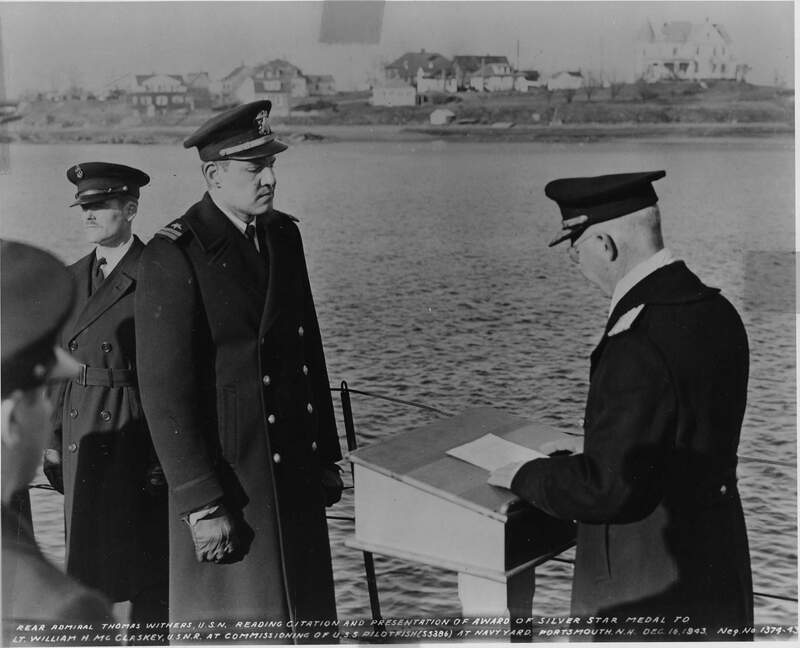 Photograph # 19-N-114578 from the Bureau of Ships Collection in the U.S. National Archives. 43k Commemorative post mark from issued on the Pilotfish (SS-386) at Operation Crossroads Nuclear Nuclear Test Baker. Photo courtesy of marshall.csu.edu.au. Spennemann, Dirk H.R. (2002). 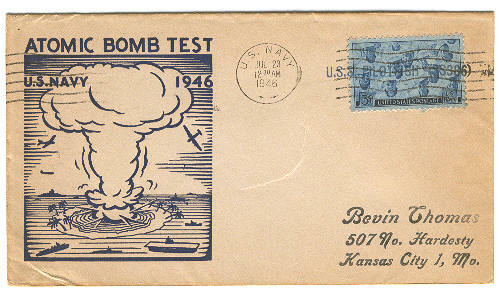 Special Philatelic and General Use Covers to commemorate the Operation Crossroads Nuclear Nuclear Test Abel. 186k The array of target ships in Bikini lagoon for the Baker shot of Operation Crossroads. Half of the target ships were outside the area of this map. The ten red X's mark the ten ships that sank. The table (left) contains the key to ship numbers. 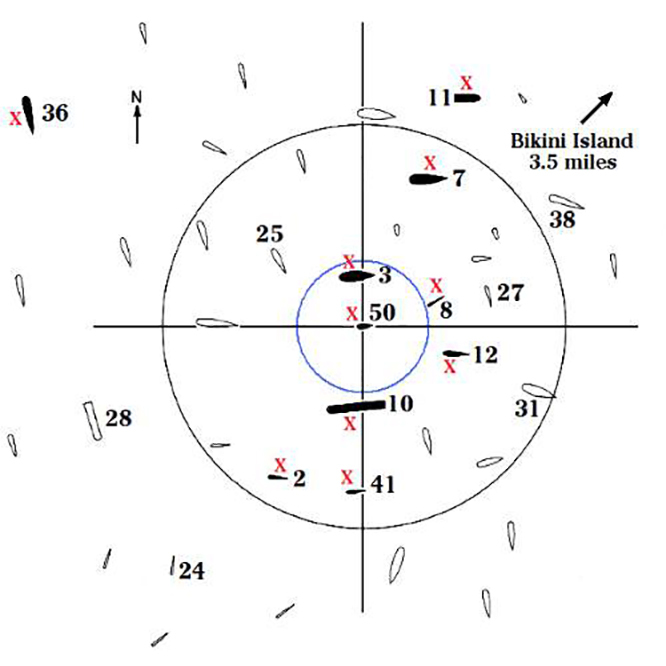 The black circle, with a radius of 1,000 yards (914 m) from the point of detonation, outlines the area of serious ship damage. The blue circle, 330 yards (302 m) radius, marks the rim of the shallow underwater crater created by the blast, as well as the outer circumference of the hollow water column which enveloped Arkansas (BB-33). 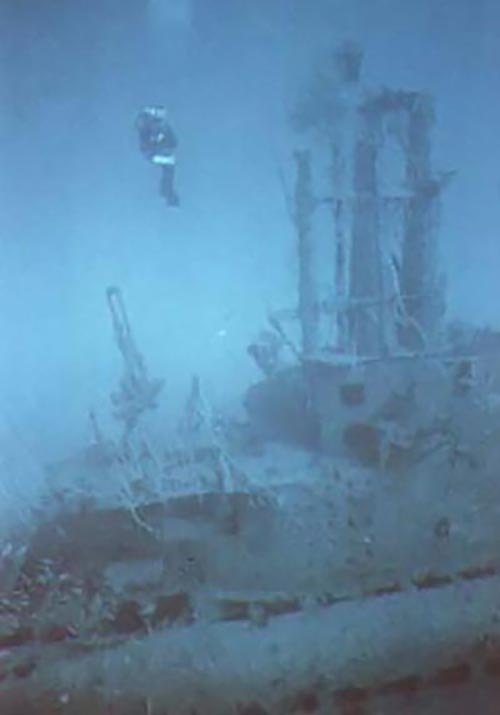 The submarines were submerged: Pilotfish (SS-386), ship #8, to a keel depth of 56 feet (17 m), Apogon (SS-308), ship #2, to a keel depth of 100 feet (30 m), and Skipjack (SS-184), ship #41, to 150 feet (46 m). National Park Service photo, Jerry Livingston and Larry Nordby - Delgado, James P., et al., The Archeology of the Atomic Bomb, National Park Service, Santa Fe, New Mexico, 1991, Baker map on p 17,., via wikipedia.org.